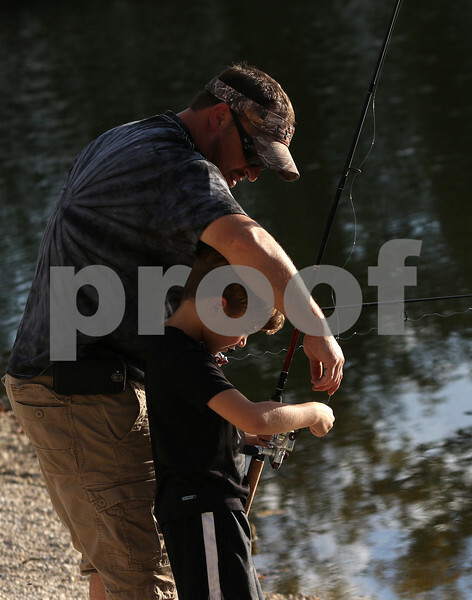 Mike Olson of Sycamore helps son Charlie, 8, with a tangled fishing line on Monday, Oct. 9, 2017 at Sycamore Rotary Park Lake in Sycamore. "It's enjoyable," Mike said, adding "the weather is exceptionally nice. It's a teaching lesson, something to cross off our boy scouts tasks." He laughed when asked about the nightcrawler bait he was using. "It's something I taught them when we first started fishing in Wisconsin, to bait their own hooks."